A Delphi study was undertaken to develop a framework guidance that would rationalise and standardise the care of children with febrile neutropenia (FNP) across the UK. A mailed Delphi survey was undertaken with health professionals working in children's cancer units. The survey employed two rounds of feedback on 22 practice statements drawn from a systematic review of clinical evidence. Consensus was assumed for any statement where 80+ % of respondents indicated that they “agreed” or “strongly agreed”. Consensus was reached on 21 of the 22 practice statements in round 1 that were categorised into six areas: definition of fever and neutropenia, initial management and choice of antibiotic, defining low-risk patients, strategy in low-risk patients and alternative approaches. Consensus could not be reached on whether patients needed to be afebrile to be suitable for discharge and the required length of outpatient antibiotic treatment. A Delphi survey allowed the successful development of a national framework for identification and management of children with FNP. The use of an existing well-functioning professional network was key in this project's success. 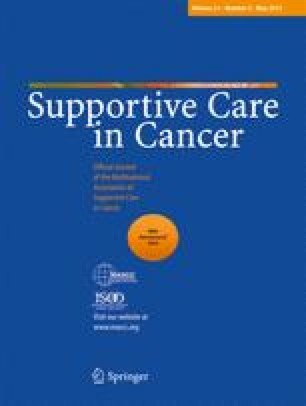 The authors would like to thank the Coordinating Centre: Children's Cancer & Leukaemia Group, CCLG Data Centre, University of Leicester, Leicester, which support the CCLG Supportive Care Group. Thanks also go to CCLG centres that participated in the study. Febrile neutropenia (FN) is the second commonest reason for admission to paediatric oncology wards, and accounts for a considerable part of the morbidity associated with cancer in children and young adults. Four centres vary, using primary temperatures of > 39 °C or > 38 °C (one of these centres uses a secondary temperature of > 37.5 °C twice). Most of the literature used to define risk of FN has failed to demonstrate any influence of admission temperature in defining risk of serious infection. Many RCT and cohort studies use 38.5°C as an inclusion criterion. The EORTC (European Organisation for the Research and Treatment of Cancer) group defines “febrile” as temperature > 38.5 °C or > 38 °C twice in a twelve hour period. Marrow suppression has been shown to be a risk factor for infection. The EORTC definition is ' < 0.5 × 109/L or <1 × 109/L and falling'. There is considerable experience in some UK centres of safely using a cut-off of N < 0.5 × 109L as a definition of neutropenia. All current policies strongly re-enforce the concept that a significantly unwell child with malignancy should be considered functionally immunosuppressed, and antibiotic therapy commenced promptly. There are three small RCT [12, 39, 40] of out-patient therapy in paediatrics (total of 366 episodes), but they are too small to confidently define the safety of this approach. Systematic reviews have shown no clear difference in treatment efficacy between initial carbapenem monotherapy and dual aminoglycoside/penicillin or cephalosporin combinations in paediatric febrile neutropenia. . It should be noted that the UK units which use an initial montherapy (meropenem) use early addition of aminoglycoside in patients who are septic (or look unwell) as part of their management. There is growing concern about the increasing frequency of isolation of extended spectrum beta-lactamase (ESBL) bacteria in the UK . Units using primarily cephalosporin or quinolone monotherapy should pay particular attention to this issue in the local flora. A systematic review of the paediatric literature supports the use of once-daily dosing in children requiring aminoglycosides for improved bacteriological results and reduced nephrotoxicity . Different units may wish to compile different lists of chemotherapy protocols, which exclude patients from a low risk strategy. The majority of patients presenting in these groups will already be ineligible for low-risk treatment because of marrow suppression. It is our experience that the list of protocols is helpful for staff who are less experienced in paediatric oncology. The literature that looks at risk stratification has identified low monocyte count, signs of sepsis, and selected chemotherapy protocols as important markers of severe infection. In order to be suitable for early discharge on oral antibiotics, patients in all units practicing risk stratification demand similar features (well, culture negative, capable family; two centres specifically exclude patients on selected 'high intensity' protocols). Out of six centres using risk stratification, four have an ANC requirement before early discharge (2 require neutrophils ≥ 0.1 × 109/L, 2 require neutrophils ≥ 0.2 × 109/l). Five centres require the patient to be afebrile (for 24 or 48 h), one specifically states that such a requirement is unnecessary. Seven centres include an option for outpatient oral antibiotic therapy in a selected low risk group after an initial period of in-hospital treatment. (In 6 of 7, this initial therapy is by intravenous antibiotics). Five protocols specify an outpatient oral antibiotic regimen to be used. The protocols surveyed indicate a very large number of centres stop all antibiotic therapy in well patients after 48 hrs afebrile and cultures negative. The published literature we have identified comparing IV and PO antibiotics has all used moderate duration total courses (5–7d). The audit data that we have from London used “until 48 h afebrile” and that from Leeds used “5 days total” therapy. No literature has compared different durations of therapy, although it is clear that neutrophil recovery is not required for safely discontinuing antibiotics. This approach has been used for 4 years with ~50 episodes of febrile neutropenia treated in this way. No children have died or required intensive care treatment in this group.